This is experienced as short jabbing pains around the mouth, jaw and forehead. It is more common in women over 55 years of age. It is caused by a degeneration of the trigeminal nerve in the jaw. 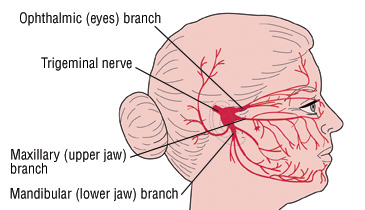 This condition is evidenced by a pressure upon the trigeminal nerve. It not currently known what triggers these headaches. One theory is that toxins accumulate in the nerves of the area, causing a pressure build up. Treatment may include injections of the nerve with alcohol. Anticonvulsants may be helpful to shorten attacks or cause remission. Surgery may be needed to lesson the severity of the attacks. Nutritional supplements can be taken which will bring some relief. Essential fatty acids found in flaxseed oil and Ultimate Oil from Nature's Secret are good sources. Taken as directed, these can help to rebuild and repair damaged nerves. Lecithin granules, 2 tablespoons twice a day or capsules 2,400 mg twice a day with meals, is important for protecting the nerves and repairing them. If you suspect toxicity see a good toxicologist to determine which substances are possibly affecting you. Then work out a good nutritional plan with supplements for detoxifying your system. Magnet therapy can be applied directly to the area affected, to soothe the nerves involved. The south pole supports biological healing, decreases pain, and fights infection and the effects of toxins. Use a 4 by 6 by ½ " ceramic magnet, applied 20 to 30 minutes each day. According to Louise L Hay in her book, You Can Heal your Life, neuralgia is present because of a need for punishment for guilt, and anguish over communication. New thought patterns to cultivate are "I forgive myself. I love and approve of myself. I communicate with love."